An angel of death floats over The Beth, an old fashioned Yorkshire hospital with fading marigold walls, embellished with NHS blue signage, which is clinging on to life by the skin of its teeth and the generosity of the community. As the hospital battles against its decommissioning, a camera crew arrives to document what it means to the patients on the geriatric ward, and staff members who tend to them, but they get more than they bargained for as the camera uncovers dark secrets and outrageous scandals on the seemingly well-tended ward. Allelujah! 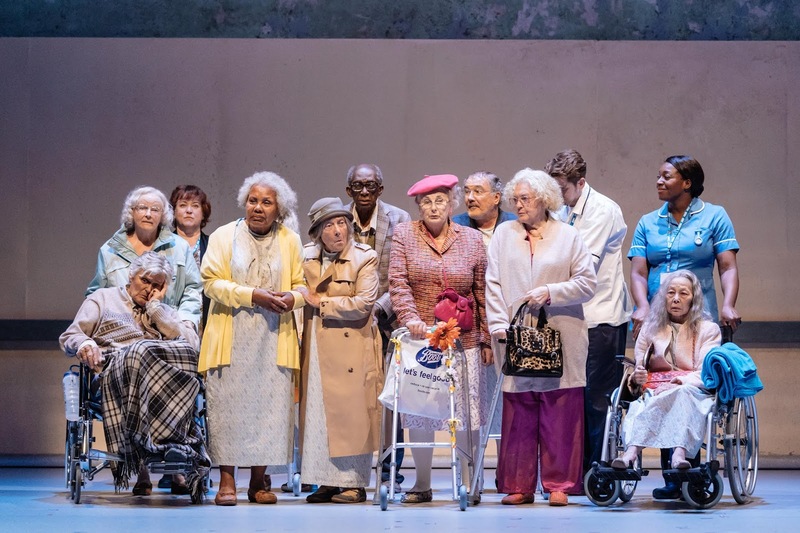 is the latest play from playwright Alan Bennett, directed by Nicholas Hytner, and it's a dark one. Humourous too, of course, and full of Bennettisms, but dark nevertheless. Setting a play within the walls of a hospital automatically signals oncoming disease and death, but he still manages to formulate shocking moments of tragedy, injected with a generous dose of bleakness for good measure. However, there are also a fair few chuckles to be had. The 12 elderly patients who populate the geriatric ward are fascinating band, each with their own distinct personality. It's a testament to Bennett's talents as a playwright that despite Allelujah! 's gargantuan cast of 25, each and every character has their own very defined story. Simon Williams' Ambrose, a rather cavalier retired school teacher waiting for an old pupil to pay him a visit, is one of the most cleverly drawn characters, bringing humour to the role, as well as a sense of impatience. 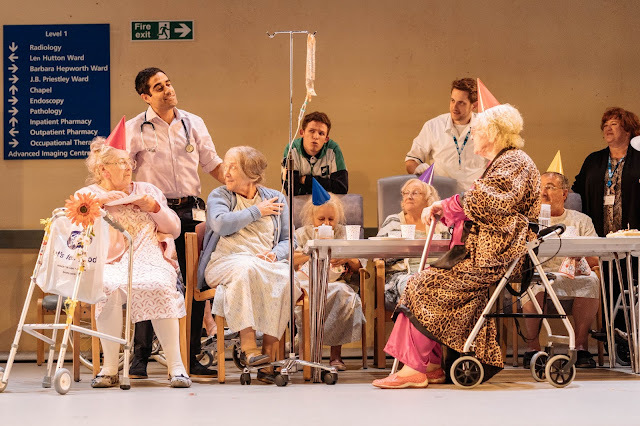 There's plenty of gaggling and gossiping going on in The Beth's geriatric ward, but also lots of singing, as a nurse has encouraged the patients to take part in a choir. Their musical offerings bring levity to the play's proceedings, as well as highlighting the reminiscence and nostalgia which the patients revel in. However, despite the sweet and clever writing, for a sizable chunk of the first act, a whole lot of nothing actually happens on stage. Samuel Barnett's lycra clad management consultant to the minister for health in particular draws the short straw here, as the character has not got much to do other than loiter cynically around his father's sickbed spouting about his desire to shut the hospital down. He's a well drawn, well played character, but it feels as if he's just passing through, and for all his insidious scheming, he never really takes much action. On the other hand Deborah Findlay's sallow-eyed Sister Gilchrist has no problem taking things into her own hands as she strives to maintain a slickly run ward, largely for her own peace of mind, no matter the cost. Findlay's Gilchrist is an ominous presence floating spectral through the hospital and juxtaposing Nicola Hughes' rather more buoyant Nurse Pinkney. Allelujah! highlights some of the hospital's foibles and flaws, but also shows how so many rely on it every day. However, instead of trying to improve it, it is being dismantled before the very eyes of those who need it most. It's stark and frankly quite scary. And a painful metaphor for the restlessness of the nation as a whole. We're undoubtedly living in a time of uncertainty, with Brexit fostering an ugly anti-foreign sentiment (Sacha Dhawan's well-liked Doctor Valentine is risking deportation after his student visa expires because, as a disembodied voice reminds him patronisingly after he states his case to remain, 'we have our own doctors'), and the NHS is at constant risk of dismantlement. It's no coincidence that this play debuts in the same year as the NHS celebrates its 70th anniversary.